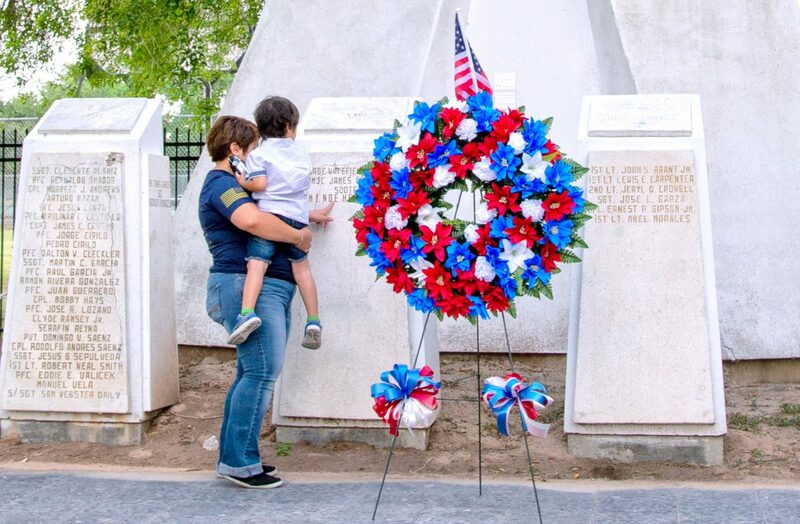 Dora Hernandez reflected on the time when she and her late husband walked through Mayor Pablo G. Pena Park, while in high school, to the veterans memorial in Weslaco. “He took me. He was like, ‘I’m going to show you something,’” Hernandez said, thinking back to the time they were together as teenagers at the memorial. Last week, she was there again, but this time to honor the memory of her fallen husband Noe Hernandez, a U.S. Navy sailor from Weslaco who died aboard the USS Fitzgerald, which was struck by a Philippine container ship in Japan last year. “He made a point to let me know, and to make sure that he paid his respects to the people on the walls,” Hernandez said. Overcome with emotion, Dora Hernandez wipes away tears after seeing her late husband’s name engraved on Veterans Memorial at Mayor Pablo G. Pena City Park. She was accompanied by her longtime friend Amanda Vasquez and her 5-year-old daughter Allison Marie Rios. Now, others are honoring the U.S. Navy Gunner’s Mate 2nd Class, who often commemorated the lives of fallen servicemen before him. 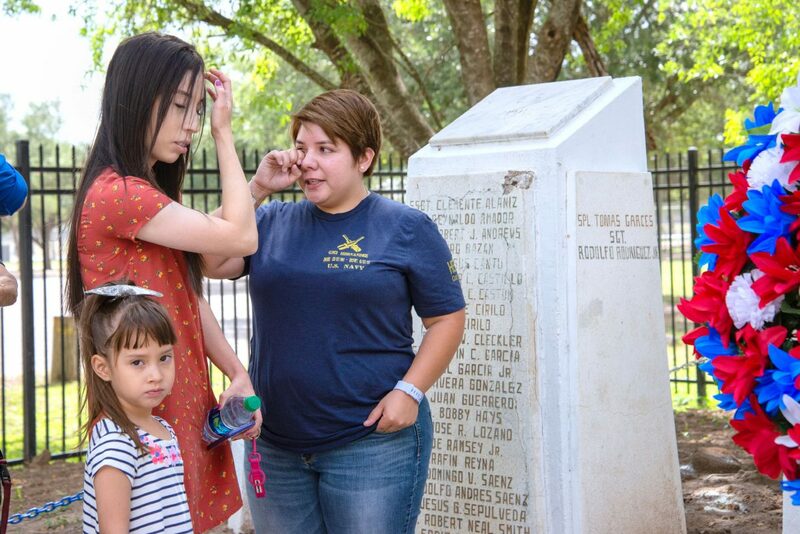 Dora Hernandez and her mother-in-law Virginia Yolanda Hernandez Lozano were joined by community members and veterans who gathered this month to honor Noe Hernandez during a ceremony at the veterans memorial, which now includes his name on a pillar. The community support, she said, has helped her get by and cope with many firsts, including the first Christmas after her husband’s death. “The first year is the hardest,” Hernandez said. The 27-year-old widow and mother of one will spend her first Memorial Day without her husband on Monday. “This is something that I will be doing for the rest of my life, honoring my husband during Memorial Day,” Hernandez said. In June 2017, Hernandez and six others aboard the USS Fitzgerald were killed when the Philippine-flagged ship enroute to Tokyo collided into the U.S. Navy destroyer off the coast of Japan, causing water to flood into the area where they slept. Dora Hernandez, who had been living in Japan with their son, has been readjusting to life without her high school sweetheart since the summer of 2017. “He was happy that I was a capable woman,” Hernandez said. Hernandez, clearly appearing determined and strong, said their son Leon Hernandez has kept the family composed since the death. “We always thank his papa for watching over us,” Hernandez said, adding that she keeps photos of her late husband throughout their home. Hernandez knows she’s not alone in mourning loved ones this Memorial Day. She encourages others to attend community events honoring service members or spend a few seconds reflecting. “(Even) just at home or at the beach, if they can just take one moment, and stop to think and say a prayer for all those who have lost someone as well,” Hernandez asked of others. “It’s helped. It helps to know you’re not alone. Dora, who is pursuing a Bachelor’s degree in psychology, will continue sharing stories of her husband with her son who’s now 4 years old. “I try to make him proud,” Hernandez said. She will continue honoring not only her husband, but others who have committed their lives to service. “At the end of the day, I know people die no matter what, but it’s definitely good to see that someone who died for their country is not being forgotten,” Hernandez said.